The six most influential business books in 2014 have been chosen as finalists in the Financial Times and McKinsey Business Book of the Year Award. Bit of an anticlimax actually. No Jim Collins / Stephen Covey style authors with their novel thinking. And no inspiring Steve Jobs style biographies with nuggets of inspiration. The Second Machine Age provides an overview on globalisation and the Internet, and gives us a glimpse of where we’re heading – although no special insights for those of us who work in it every day. 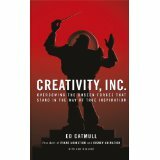 And Creativity, Inc is really a story about Pixar, the animation company that made Toy Story (amongst other movies), with a few management tips thrown in. Previous PostLeadership and the Social/Digital Revolution: Are you becoming the Laggard? Next PostWill Abbott make a good wartime Prime Minister?